Bottled ketchup may dominate the condiment shelf at the local grocery store, but 100 years ago it wasn’t so easy to come by. In fact, it wasn’t unusual for families to make their own ketchup from vine-ripened, home-grown tomatoes rather than use store bought. So why should we bother making our own when we can run to the store? One very good reason—taste. Today’s favorite condiment pales in comparison to yesteryears bold, thick, and brownish concoction. And, when you consider all the additives, fillers and preservatives in today’s bottle of ketchup why not make your own. Another reason is the ability to experiment with spices to create your own unique version. The basic recipe for catsup hasn’t changed much over the years. All versions use the same basic ingredients of tomatoes, vinegar, sugar and spices. But it’s the spices that can vary the most. Ketchup is technically fruit butter, meaning that it is spreadable, like butter. Fruit butter recipes are fairly simple. You take some fruit, add some sugar, and cook it way, way down. 1. 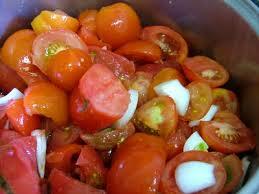 Remove bad parts from the tomatoes. Wash and quarter and place in a very large stock pot, along with the onion, garlic, and red pepper flakes. Crush the mixture a bit to release some liquid. Bring to a slow simmer for 30 minutes. Let cool. 2. Run the contents of the stock pot through a food mill in batches, using an old-fashioned kind of food mill with a fixed fine disk works best. 3. Put the milled mixture back into the stock pot and simmer very slowly (to keep the tomatoes from burning), until the volume is reduced by about 1/2. It should have the consistency of thick tomato sauce. This step may take 6 to 12 hours, maybe more, depending on the tomato variety. Let cool. 4. Run the contents of the stock pot in batches through a blender. 5. Return the mixture to the stock pot and bring to a simmer until the mixture is the consistency of commercial catsup. This step may take six hours or more. 6. Add the remaining ingredients, bring to a simmer, and reduce to the desired consistency. (This is where it can get personal. You can make the catsup thick or thin depending on what you like and what you’ll use it for). 7. Prepare 8 – 10 pint canning jars, lids and bands. Prepare water bath canner; keep water boiling with lid on. 8. Fill hot jars with catsup, leaving 1/2-inch of head space. Wipe jar rims, put lid on, screw down band finger tight, and place in canner. Put lid on canner and process in boiling water bath for 15 minutes. Remove jars from canner; listen for the ping as the catsup cools and the lids pop into place. Let the jars sit until cool. Store in a dark place. Go ahead and try it. What else are you going to do with all those end of season tomatoes? Did you know that the modern catsup/ketchup started out as a Chinese fish sauce?